Phoenix transportation is operated by Valley Metro. This includes many bus routes and a Light Rail line. Valley Metro operates a number of services which are detailed further below. Valley Metro services run in sync with other services for travelers making connections. Depending on your destination, you may have to get more than one bus. Valley Metro notes that you should arrive at your bus stop or Light Rail station five minutes before your bus or train is due. All buses are capable of transporting bicycles. You can also bring your bike onto the Light Rail with you. Buses in Phoenix are mainly used by commuters, school-goers and college students. Light rail and bus tickets can be bought at Park&Ride destinations, online or in store. Bus tickets can also be bought on board and rail tickets can be bought at rail stops. You can also purchase day passes, seven day passes and yearly passes. Children under six ride free. Youths aged 6 to 18, senior citizens aged 65+ and persons with disabilities qualify for reduced fares. ASU offer reduced passes for their students. Some areas also operate special pick-up services for those with disabilities. Local Bus routes - These frequent buses run from early in the morning to late in the evening. They connect travellers all across Phoenix, Chandler, Mesa, Gilbert, Tempe, Avondale, Glendale, Peoria, Paradise valley and Scottsdale. There are many services running in many different directions. These buses run frequently - generally every fifteen minutes. There are also Local Limited Stop bus services that run on specific times for commuters. Metro light rail - The Metro Light Rail operates right through the city starting at Mesa, going through Tempe, by Phoenix Sky Harbour international airport, right through the center of the city and ends north towards Glendale. Trains operate in both directions. 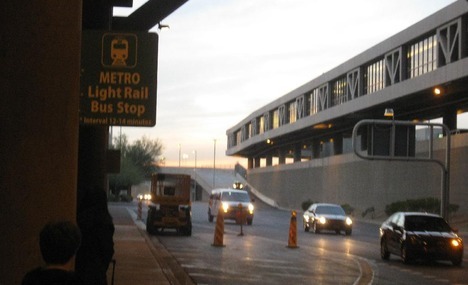 The Light Rail connects to multiple bus connections, Park&Ride centers and a free airport shuttle service. The light rail is perfect for getting around in Tempe, Mesa and Phoenix. Other areas are connected by bus. The Light Rail runs from 4.40AM to 11PM. On Fridays and Saturdays the service is extended to 2AM. The train runs every 12 minutes, or every twenty minutes before 7.30AM and after 6.30PM. On Sundays the train runs every twenty minutes from 4.40AM to 11PM. Neighbourhood Circulators - Valley Metro run a number of local bus routes, most of them are free. They connect the community to local shopping destinations, parks, recreation centers, libraries, schools, employment and connections to further buses. These bus services run in the following areas: Avondale, Glendale, Mesa, Phoenix, Scottsdale and Tempe. Some of these services run less frequently, often every half hour. They also end early in the evening. Phoenix RAPID services - These buses connect key suburban areas to Phoenix city center. They operate along I-10 east, I-10 west, I-17 and the SR-51. These bus routes operate toward the city center in the morning hours and out of the city in the even hours. RAPID services connect you to your destination much faster than a standard bus service. These services have very few stops. Express services - Similar to the RAPID service, Express services also run towards the city in the morning hours and out of the city in the evening hours. They connect commuters from Scottsdale, Tempe, Avondale, Chandler, Buckeye, Red Mountain, Mesa, Gilbert, Northwest valley, North Mountain, Goodyear and Surprise to Phoenix city center. Many Express services run on a very limited basis. LINK services - LINK services are a unique way of travel. These state of the art bus services are similar to rail in comfort, reliability and speed. LINK buses have traffic signal priority and free on board wifi. Valley Metro runs two LINK routes, servicing areas from Chandler Park&Ride to Sycamore Transit center (connections to light rail) and from Superstition Park&Ride to Sycamore Transit Center. These services run frequently. Phoenix Transportation is recognised as a reliable and efficient service. However public transport isn’t as popular in Phoenix when compared to other cities. This is due to efficient roads and the extreme heat during the summer months. Many routes are limited and end early in the evening. It is recommended that you plan out your trip before traveling.